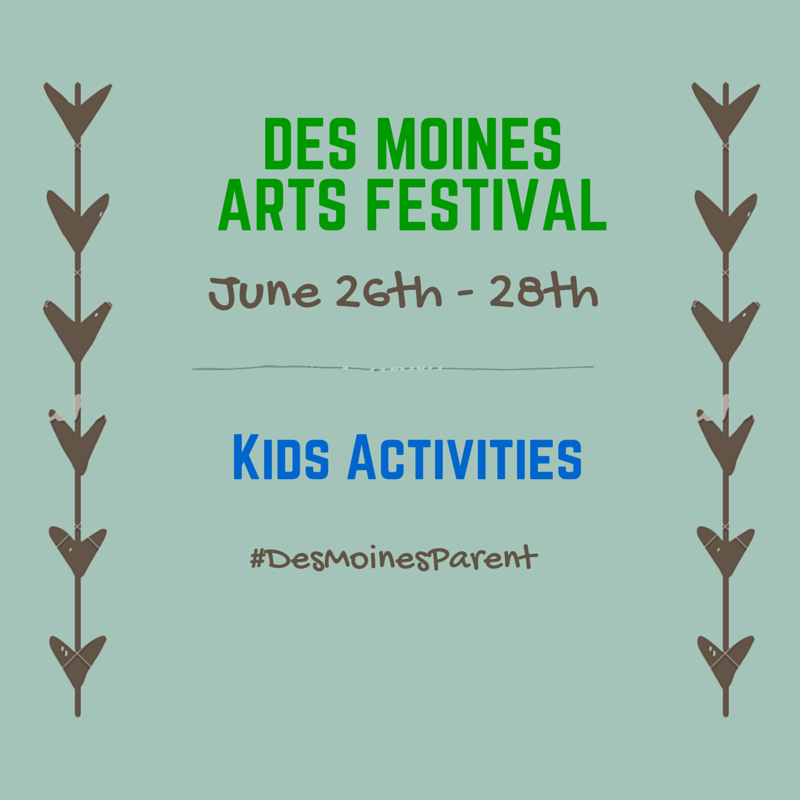 The Des Moines Arts Festival starts this week! 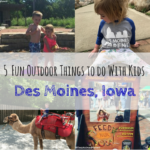 This is one Central Iowa event, that we try and visit every Summer. It’s FREE to attend and there is so much that is offered for everyone! 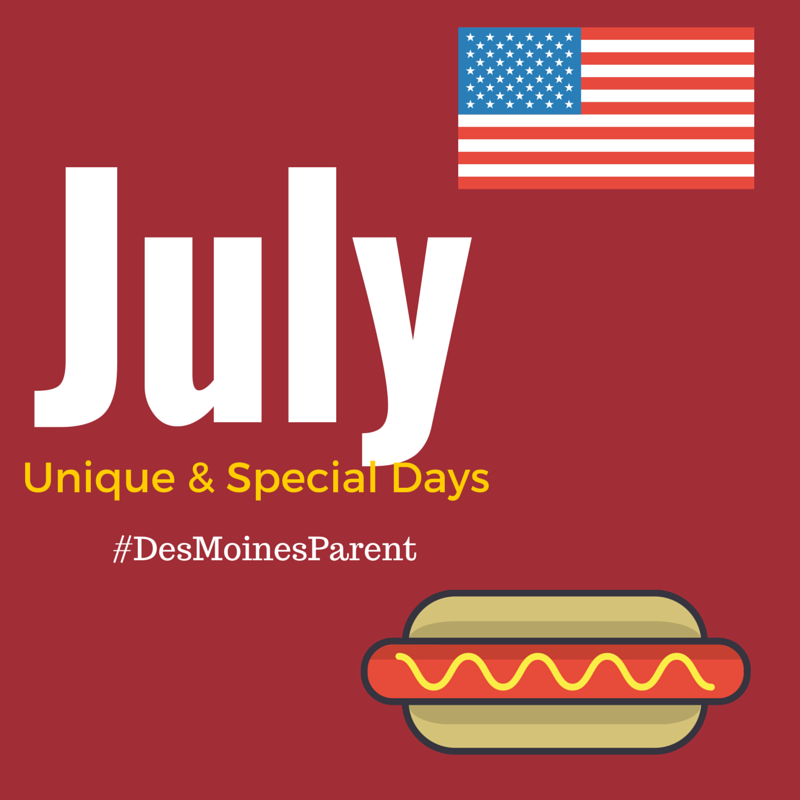 Friday, June 26 – 11 a.m. – 10 p.m.
Saturday, June 27 – 11 a.m. – 10 p.m.
Sunday, June 28 – 11 a.m. – 5 p.m. Complete Schedule – AWESOME feature! If you want to save an event so you remember when and where it is happening, you can click “Add to my calendar” and it will add to your mobile calendar! 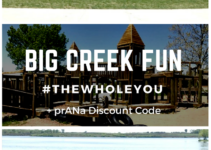 Below is a list of children’s activities being offered by local businesses and organizations, located in the Creative Family Zone. Some are free and some may ask for a small fee or donation. AARP Iowa – Create a wearable art reminiscent of Milagros style engravings using craft foil and a wooden stylus. Animal Lifeline of Iowa – A custom coloring table where you can draw your favorite animal or you can play feed the animals, bean bag toss game. Anawim Housing – Learn how to make things grow and thrive by planting your own flowers in a decorated flower pot. 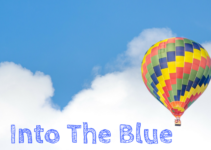 Animal Rescue League of Iowa – Spin the prize wheel and color a coloring sheet. Blank Park Zoo & Living History Farms – Color a picture of a zoo animal and have it made into a button you can wear! Des Moines Downtown Chamber of Commerce – Draw a picture of your dream business and get your photo taken using the Downtown Chamber’s giant scissors to cut the ribbon for your new business. HCI Care Services and VNS of Iowa – Create & decorate a book of memories to honor a loved one. 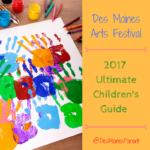 Susan G Komen Iowa – Participate in the Kids for the Cure Art Contest! Iowa District Optimist – Spin art with colors of your choice and a short internet safety video. 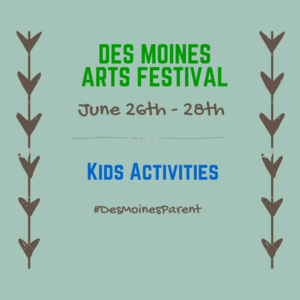 Des Moines Social Club – Marble painting activity! IowaCASA – Decorate coloring pages with images that reflect hope and healing. AHeinz57 Pet Rescue and Transport – Make a homemade fleece toy for your favorite dog! 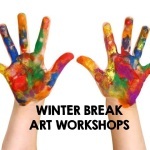 Walnut Creek Church – Create a colorful mosaic using tissue paper and light glue. Teaching Leaves Inc. – Experience Native American culture by looking at animal dies and traditional clothing, as well as an opportunity to hear flute music and play the drums and rattles. Salsa Des Moines – Take a short dance lesson of salsa, cha cha, bachata, merengue and salsa rueda. Westside Early Education – Create your own sunshine using paper plates, pipe cleaners, beads and more! Science Center of Iowa – Use origami techniques to make an artistic paper airplane. Altoona Lions Club – Make a colorful array of spin art! 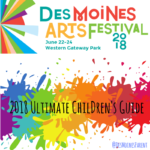 Iowa Dance Theatre – Make colorful braided scarves to move and dance with. The Salvation Army – Make paper tambourines using plates, bells, stickers and more! Stop by the Arts Festival Shop and purchase a t-shirt or backpack, then walk next door to decorate it yourself! Live music! There is a lot open green space! Find a place to relax and enjoy one of the many artists lined -up to perform. The kids will love to dance and run! Don’t miss Debbie Doo Wop & Dynamite Dan on Friday, June 26th at 11 am – 12 pm! Don’t miss when the Des Moines OnStage Children’s Theater performs a scene from Rent on Sunday, June 28th at 11 – 11:30 am! Let the children run through and explore the John & Mary Pappajohn Sculpture Park! Bring cash! Some food vendors and shops may accept cards, but not all. There are 4 different ATM locations. If you are bringing a stroller, throw a large blanket and/or foldable chair for sitting & listening to the live music. Bring water bottles & snacks! There are food vendors, but you may want to eat one big meal. Check out the schedule and add the events you would like to see to you mobile calendar, so you have it on hand!